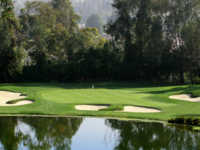 Industry Hills Golf Club offers players two choices and some of the most enjoyable golf to be found anywhere. The Zaharias Course, named after legendary female athlete Baba Didrikson Zaharias, is the sister course to the Eisenhower. Together they make it easy to book City of Industry tee times. Nicknamed The Babe, the Zaharias course was designed by Billy Bell and Casey O'Callaghan. The par 71 layout with Bermuda grass has a 73.4 rating and 135 slope and plays to 6,826 yards at its longest. Although shorter than it's counterpart, The Babe challenges players with narrow fairways, sloping greens, doglegs and a number of troublesome bunkers and water hazards. Industry Hills Golf Club - Zaharias Course tee times are available between 7 a.m. to 6 p.m. on weekdays and 7 a.m. to 1 p.m. on weekends and holidays. There are also great City of Industry golf deals, including a Stay and Play package at the Pacific Palms Resort. Industry Hills is also available for social events and tournaments.